Jointly managed by the Cultural Affairs Bureau, the Sports Bureau, the Macao Government Tourism Office and Institute for Tourism Studies, “Anim’Arte NAM VAN” transforms Nam Van Lakeside Plaza into a waterfront leisure hub with a distinct character combining creativity, leisure and dining. The project aims to provide residents and tourists with diverse tourism experience, thereby enhancing Macao’s cultural tourism products offerings. A tiny cultural and creative shop blending with natural and industrial styles, M Dimensions brings more than thirty Macao cultural and creative brands, with hundreds of unique, fine, made-in-Macao products. It also organizes arts and cultural activities such as workshops, performances and exhibitions. Amazing Creation & Collection specializes in handmade products with Macao features, and is a walk-in shop for learning about Macao’s history, understanding Macao people’s ideas, and experiencing the city’s unique culture. In addition, it holds workshops on weekends in order to offer you a special cultural experience. 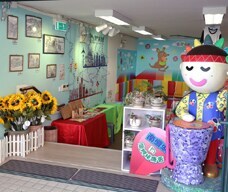 To encourage charitable organizations to be more involved in cultural and creative industries, the Cultural Affairs Bureau is cooperating with two charitable organizations included in the Database for Cultural and Creative Industries of Macao, namely the Fuhong Society of Macau and the Caritas Macau, in setting up a shop at Nam Van Lakeside Plaza to sell original products created by disabled artisans. The shop is served as a platform bringing a new force to the Macao’s cultural and creative industries. A subsidiary of the Fuhong Society of Macau, Happy Art Studio is a venue for people with special needs to learn arts and sell art products made by disabled artisans. With the aim to promote arts among this special group, the studio is offering different courses as a therapeutic medium, encouraging participants to free their artistic potential, break down social barriers, and get better integration in order to build a more harmonious society. Fees: 2-seat Pedal Boat: MOP20 per 30 mins. / 4-seat Pedal Boat: MOP40 per 30 mins. Children under 5 years old are not allowed to use the pedal boat. 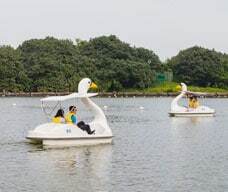 Children aged between 5 and 12 years old are not allowed to use the pedal boat unless accompanied by an adult.